The first step in an ELISA experiment is the immobilization of the antigen in a sample to the wall of the wells of a microtiter plate. This can be achieved by direct adsorption to the plate’s surface or by using a “capture antibody”. The capture antibody has to be specific to the target antigen and is mainly used in a specific ELISA type called “sandwich ELISA”. After immobilization, a detection antibody is added, which binds to the adsorbed antigen thereby leading to the formation of an antigen-antibody complex. The detection antibody is either directly conjugated to an enzyme, such as horseradish peroxidase (HRP), or provides a binding site for a labeled secondary antibody. In general, ELISAs can be grouped into the four main categories: direct, indirect, sandwich, and competitive ELISAs. Figure 2 illustrates the setup of direct ELISA; an antigen is immobilized in the well of an ELISA plate. The antigen is then detected by an antibody directly conjugated to an enzyme such as HRP. Fig. 2. Overview of direct ELISA. Direct ELISA detection is much faster than other ELISA techniques as fewer steps are required. The assay is also less prone to error since fewer reagents and steps are needed, i.e. no potentially cross-reacting secondary antibody needed. Although there are some disadvantages to this method. As the antigen immobilization is not specific, higher background noise may be observed in comparison to indirect ELISA (see below). This is primarily because all proteins in the sample, including the target protein, will bind to the plate. Direct ELISA is less flexible since a specific conjugated primary antibody is needed for each target protein. As no secondary antibody is used there is no signal amplification, which reduces assay sensitivity. Finally, the direct ELISA technique is typically used when the immune response to an antigen needs to be analyzed. Best for: when analyzing the immune response to an antigen. Figure 3 demonstrates how an indirect ELISA is set up; antigen is adsorbed to a well in an ELISA plate. Detection is a two-step process. First, an unlabeled primary antibody binds to the specific antigen. Second, an enzyme conjugated secondary antibody that is directed against the host species of the primary antibody is applied. Fig. 3. 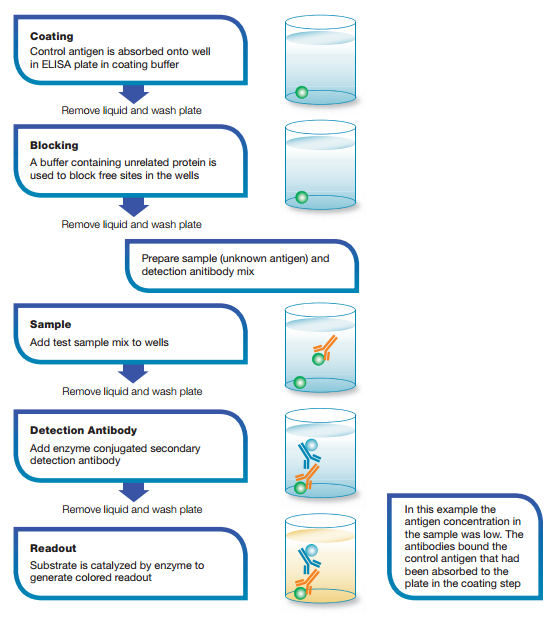 Overview of indirect ELISA. The indirect ELISA method has high sensitivity since more than one labeled secondary antibody can bind the primary antibody; it is more economical than the direct ELISA as fewer labeled antibodies are needed. Indirect ELISA delivers greater flexibility since different primary antibodies can be used with a single labeled secondary antibody. Among its disadvantages is the possibility of cross-reactivity of secondary antibody to the adsorbed antigen, which could increase background noise. Also, indirect ELISA assays take longer to run than direct ELISAs since an additional incubation step for the secondary antibody is required. The indirect ELISA is most suitable for determining total antibody concentration in samples. Best for: determining total antibody concentration in samples. Sandwich ELISAs require the use of matched antibody pairs (capture and detection antibodies) as shown in Figure 4. Each antibody is therefore specific for a different and non-overlapping region or epitope of the antigen. It is important that matched antibody pairs are tested specifically in sandwich ELISA to ensure that they detect different epitopes, to achieve accurate results. The capture antibody, as its name implies, binds the antigen that can then be detected in a direct ELISA or in an indirect ELISA configuration. Fig. 4. Overview of direct sandwich ELISA. The procedure for a sandwich ELISA firstly requires the well of an ELISA plate to be coated with a capture antibody. The analyte or sample is then added, followed by a detection antibody. The detection antibody can be enzyme conjugated, in which case this is referred to as a direct sandwich ELISA. If the detection antibody used is unlabeled, a secondary enzyme-conjugated detection antibody is required. This is known as an indirect sandwich ELISA. The key advantage of a sandwich ELISA is its high sensitivity; it is 2-5 times more sensitive than direct or indirect ELISAs. Sandwich ELISA also delivers high specificity as two antibodies are used to detect the antigen. It offers flexibility since both direct and indirect methods can be used. The advantages bring with them a few disadvantages; if a standardized ELISA kit or tested antibody pair is not available, antibody optimization has to be worked out since it is important to reduce cross-reactivity between the capture and detection antibodies. Sandwich ELISAs are particularly suited to the analysis of complex samples, since the antigen does not need to be purified prior to the assay yet still delivers high sensitivity and specificity (e.g. measuring cytokine levels in an immune response). High sensitivity - 2-5 times more sensitive than direct or indirect ELISA Antibody optimization can be difficult - cross-reactivity may occur between the capture and detection antibodies. Needs a standardized ELISA kit or tested antibody pair. Best for: analysis of complex samples, since the antigen does not need to be purified prior to measurement. How it works: the competition/inhibition ELISA, also known as a blocking ELISA, is perhaps the most complex of all the ELISA techniques. However, each of the above assay types can be adapted to a competitive format. The competitive/inhibition ELISA is predominantly used to measure the concentration of an antigen or antibody in a sample by detecting interference in an expected signal output. Essentially, sample antigen or antibody competes with a reference for binding to a limited amount of labeled antibody or antigen, respectively. The higher the sample antigen concentration, the weaker the output signal, indicating that the signal output inversely correlates with the amount of antigen in the sample. An example of a competition ELISA to test for antigen based on the direct detection method is shown in Figure 5. In this example, a known antigen is used to coat a multiwell plate. Following standard blocking and washing steps, samples containing unknown antigen are added. Labeled detection antibody is then applied for detection using relevant substrates (e.g. 3,3’,5,5’-Tetramethylbenzidine or TMB). If there is a high concentration of antigen in the sample, a significant reduction in signal output will be observed. In contrast, if there is very little antigen in the sample, there will be very little reduction in the expected signal output. In the example shown in Figure 5, there would be a reduction in signal output. Best for: commonly used when only one antibody is available for the antigen of interest. It is also suitable for detecting small antigens that cannot be bound by two different antibodies such as in the sandwich ELISA technique.